A picture of Marian Gooding, from the Alton United Methodist Church, was on the back cover of the September Response magazine, the national magazine for United Methodist Women. She had been on a United Methodist Womenâ€™s Ubuntu journey to Zimbabwe. 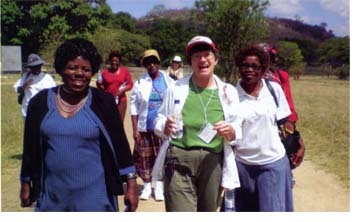 Ubuntu Journeys are unique, short-term mission service opportunities of United Methodist Women to interact with the world through mission partners. We caught up with her at the Alton United Methodist Church and asked about her experience. 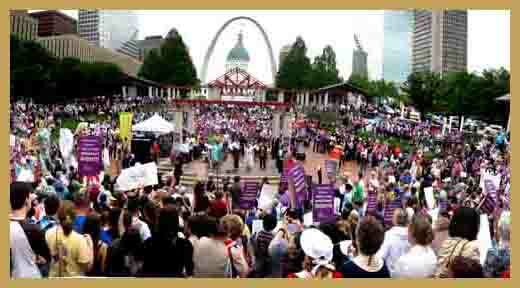 Marian will happily share this experience with UMW groups in Missouri. 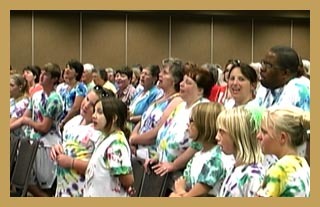 The Midstate District United Methodist Womenâ€™s â€œShow Me Girlsâ€ participated in a Volunteers in Mission project at the Midwest Mission Distribution Center, in Chatham, Illinois. The distribution center collects, processes and distributes kits and items needed for disaster relief across the country and around the world. In this MissionCast LaVonne Patterson tells of their experience and encourages others to serve at the MMDC as well. The Midstate UMW are sponsoring another mission like this the week after Easter in 2013. For information about their next mission as well as information about the Midwest Mission Distribution Center call or email LaVonne Patterson. (573-239-3158 / lilpat@mchsi.com) Our thanks to Lavonne for the script and narration of this MissionCast and to Pati Tynes for her great pictures. The Cooperative School of Christian Mission was held this past weekend in Fayette, Missouri. MissionCast #278 shows some highlights of this very special mission educational event held each year sponsored by the Creative Ministries Team and the United Methodist Women. The study topics this year were: The People of Haiti; People Living in Poverty and Immigrants, Refugees and Migrants. The school included people of all ages. 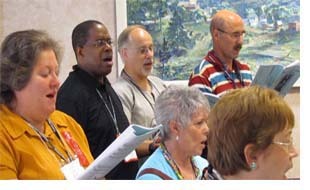 The 2010 Cooperative School of Christian Mission was held on the campus of Central Methodist University in Fayette, Missouri. The school is sponsored by the United Methodist Women and the Creative Ministries Team. This MissionCast presents some of the highlights of the school. Also check out the list of MissionCasts at the right indexed by category.Instructions for downloading videos to your computer: Right click on one of the links above and select â€œsave link asâ€ or â€œsave file asâ€ then tell your computer where you want to save the file and click OK.
Every four years United Methodist Women from all over the United States gather for an Assembly.Â In 2010 they came together in St. Louis, Missouri.Â This three minute MissionCast shows just a few of the highlights from 2010. 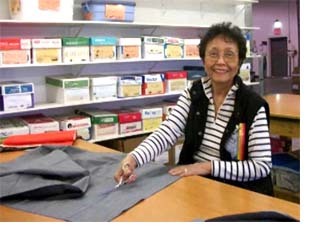 Mrs. Mai Gray who served Missouri and the General Church in so many ways died shortly after the 2010 Assembly after falling and receiving a head injury.Â As a former president of the Women’s Division of the General Board of Global Ministries she spoke at the Assembly.Â Click her picture or below to hear what she said. Instructions for downloading videos to your computer:Â Right click on one of the links above and select “save link as” or “save file as” then tell your computer where you want to save the file and click OK.